Love Gracefully has been busy all over France and Europe officiating wedding ceremonies. Even better though, is seeing the love and joy as couples celebrate their love together. We recently had the honor of joining Alaine and Peter who got married in Paris’ Chapelle Expiatoire. Why is the Chapelle Expiatoire a great ceremony location ? 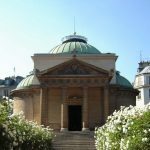 The Chapelle expiatoire is a chapel located in the eighth arrondissement of Paris, which is very central. This chapel is dedicated to King Louis XVI and his queen, Marie Antoinette but most importantly, it belongs to the french state, not to the church. Because of that, it’s the only place in Paris where you can actually have a ceremony in a chapelle. All the other Paris churches does not allow elopements for foreigners mainly because the french priests do not speak english. Also, by having your wedding in that chapel, you will enjoy the exquisite beauty of it as it’s a magnificient building. Wedding Ceremonies at the chapel allows numerous guests to attend, up to about one hundred which is a fairly good number if you marry abroad ! The sound quality is excellent and one does not need a sound system to boost the volume of the celebrant’ voice or of the musicians. Your guests will be abble to seat to attend your blessing ceremony. It could sound like a normal expectation but, since we work mainly outdoors in public gardens, it is not. In pubic gardens you can not bring any chairs for the wedding ceremony. The authority see the chairs as a privatisation of the public space and, therefore, do not allow it. That’s why it’s important to mention that if you have elderly guests that need chairs to attend your destination wedding, a ceremony at the chapelle expiatoire could be a solution. Once the ceremony is over, you can enjoy the garden of the Chapelle to have your champagne or to take pictures. It’s not allowed to drink champagne inside the Chapelle. The garden of the Chapelle is filled with beautiful roses that adds to the romanticism of the venue. In all cases, brides and grooms are vey happy to have elope at the Chapelle expiatoire and keep a deep memory of their vows exchange at the Chapelle despite the logistical issue attached to it as explained below. How to book the Chappelle Expiatoire ? The chapel is not heated. And it can be a bit chilly in the winter. But since wedding ceremonies don’t last very long, it’s not a huge problem as you are protected from a much worth ennemy : the rain ! 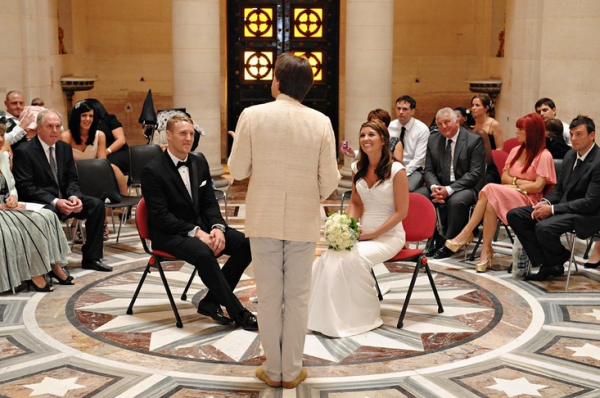 For your vow ceremony, the administrator offers you chairs for free, independently of the numbers of guests. The rental time for your marriage at the Chappelle is 2 hours. The administrator will ask you to contract an insurance for the usage of the chapel. Would you want to see the Chappelle expiatoire from the inside for your destination wedding? Would you have more questions about the Chapelle expiatoire don’t hesitate to contact us. The chapel was designed in 1816 by the French Neo-Classical architect Pierre François Léonard Fontaine, who, with his partner Charles Percier, figured among Napoleon’s favourite architects. Fontaine’s assistant Louis-Hippolyte Lebas oversaw the construction. The chapel was partly constructed on the grounds of the former Madeleine Cemetery, where King Louis XVI and Queen Marie-Antoinette had been buried after they had been guillotined. King Louis XVIII shared the 3 million livres expense of building the Chapelle expiatoire with the Duchess of Angoulême. Construction took ten years, and the chapel was inaugurated in 1826 in the presence of Charles X. When he blessed the cornerstone of the Chapelle expiatoire, Hyacinthe-Louis de Quelen, Archbishop of Paris, called in vain for an amnesty of the exiled members of the National Convention.